Thoughts from Molly James: Creative Thinker. Innovator. Educator. Lead Learner. Speaker. Writer. Researcher. Musician. Fencer. Coach. My first Kindergartners are now 10th graders. Hard to believe, but true. Recently, I had the pleasure of seeing one of them participate in the NJ Poetry Out Loud finals. She recited three poems. Each was filled with pauses, inflection, breath, emotion, and gestures, which drew me more deeply into the words and meaning of the poems. My favorite was Undivided Attention by Taylor Mali. It’s a fun, and thought-provoking poem for an educator. An added sweetness was that I was introduced to it by my alumna! If you’re unfamiliar with the poem, take a moment to go read it now. Especially if you’re an educator, read it — right now. dangling from the neck of the movers’ crane. So on the edge of losing everything. Let me teach like the first snow, falling. As I listened to my alumna recite the poem, I imagined the educator asking permission of her administrators, coordinators, and colleagues to allow her teach in this fashion. As I listened, I heard her imploring others to share her vision. Later that day I read the poem to myself, and then aloud to others. I heard it differently. I’m not completely sure why. Perhaps I heard it differently because it was my own voice that spoke the words. Or, perhaps it was because Mali’s words had been floating in my brain since the morning, somehow becoming my own. The word I heard, with soft, encouraging, invitation was me. It felt like a quiet manifesto. Much like the piano movers I need to move my personal Steinways. My Steinways are lessons, ideas, inspiration, motivation, classroom culture, design experiences, creativity, and much more. Similar to the movers in the poem, occasionally, my eye-popping, jaw-dropping, risky, awesomeness has to hang out the window. Scary, but also a huge blessing, because, hanging out the window, others can see it, engage with it, and be excited by it. First snow, falling, is nothing new, and yet each time it falls it feels new. The snow beckons all who notice it to come and look with long interested looks. It reworks the view out the window. It offers the opportunity for play, and the necessity of work. And, when examined closely, it reveals the marvels of each unique flake. That is a profound way to teach. Yes. Let me teach like that Steinway — big, brave, bold, and fantabulous. Let me teach like snow falling — offering play and work, changing views, and surprisingly breathtaking wonders. Creativity has many joyous, important, and profound purposes in our lives and world. Not the least of which is the ability to express ourselves, sort through our thoughts and feelings, and emerge, a bit stronger, with more understanding, and possibly, a nice piece of creative work. But, though I can spell it, I still have it. I’m doing great, but from time to time, I am a bit overwhelmed sharing my body with WM. And, sometimes even more overwhelming than sharing my body with it, is sharing my mind and spirit it. A couple days ago, I had the idea to write a poem – in the hopes that it would help me pull my thoughts and emotions back from the edge, into a place of greater strength, joy, and positivity — really just a place that is more me. For truly, I am strong, fierce, powerful, joy-filled, positive, awesome, and full of life! I am a warrior. My life is full of possibility. My spirit rebels at the suggestion that good things might be impossible. Possibility surrounds me, and gives my soul joyous pause. Of course, fear and doubt mingle in, at times rising to the top, obscuring joy and hope. Success is not guaranteed, and solutions are not yet seen, found, created, done, or lived. Be brave and stubborn. Believe all is possible. Live as though success is inevitable, and your actions and thoughts encourage its coming. Expect, and eagerly embrace, the awesomeness and miracles that surround, and are, you! Bubbles Art, Science, Math and Language Arts! Bubbles are fascinating and afforded us several challenging and fun ways to explore and experience science, art, math, and language arts. There was a plethora of things to notice, marvel at, wonder about, investigate and enjoy! … The variety of sizes. The delicate and yet strong nature of soap film walls. The colors and reflections that are captured in the bubbles. The many things that can be used as a bubble wand. Do heart-shaped wands make heart-shaped bubbles? The ways we feel when we blow bubbles. Should we blow slowly or quickly? Does that make a difference? Can we fill the room with bubbles if we use a window fan? The joy and sorrow felt as bubbles pop. The way the wind takes the bubbles as they leave the wand. The way the bubble solution feels, and sometimes tastes, as the bubbles pop close to our lips. 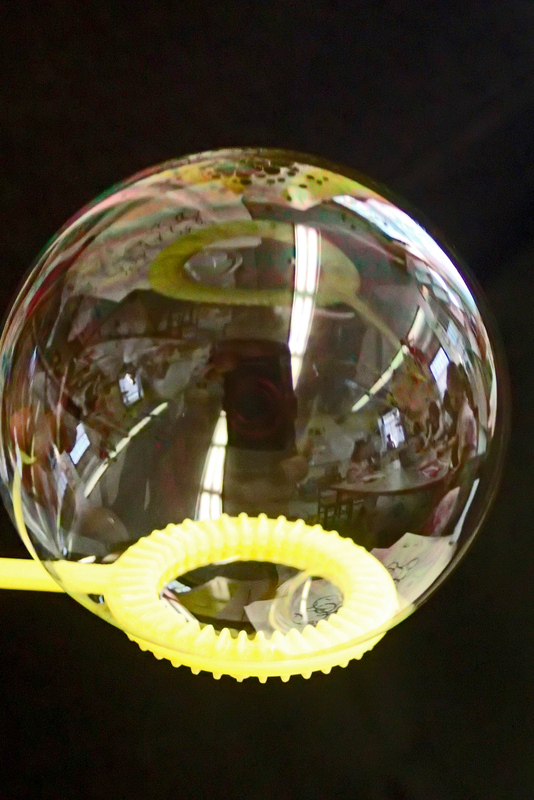 Can we create bubbles from things other than store-bought bubble solution? 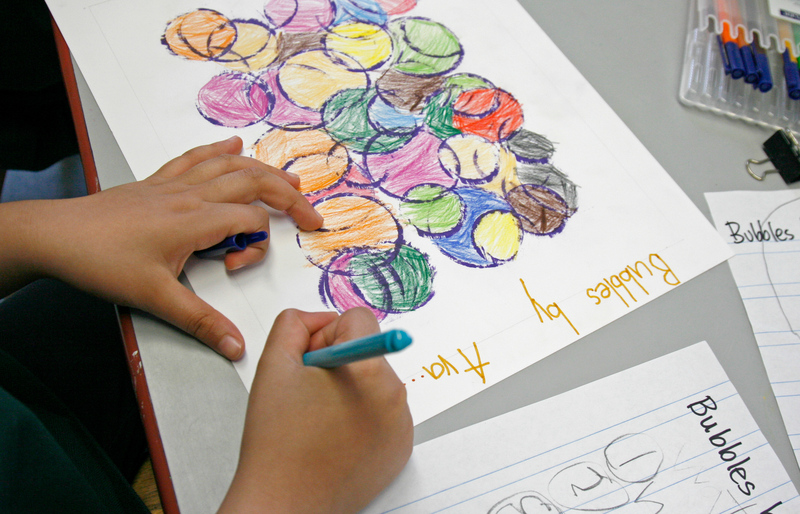 How could we create bubbles in art? What colors are bubbles? Which words best describe bubbles and our experience? Prior to starting I told the girls we would be scientists, authors, readers and artists, and that the process would take us several days. We experienced bubbles through our eyes, our ears, our brains and our bodies! We did several read alouds. I blew bubbles and the girls experienced them only with their eyes. What did the bubbles look like? How did they move? They blew bubbles. Again, as scientists they tried to observe things about the bubbles, the process and each other. We all blew bubbles, and just experienced the joy of bubbles – much laughing, movement and even some screaming! We created bubble wands using various materials: pipe cleaners, plastic plant mesh, plastic water bottles, straws and string. We tested and observed each – Was it easy to make bubbles with them? Did they make big bubbles? Small bubbles? What shape were the bubbles? Did the bubbles mirror the shape of the wand? After each experience the girls shared words and feelings, which I scribed onto a large piece of chart paper. We ended up with three lists of words. We observed the lists: How many are in each? Which list has the most words? Which the fewest? Why? (We noticed that the words increased as we engaged more fully in each experience and grew in comfort with the process.) We used math strategies to add the lists together and come up with the grand total. We marveled at our abilities to describe our experiences. We used these lists to create our list poems. I brainstormed many ways to create a frame for the list poems and finally decided (for ease and aesthetic reasons) to cut a frame to place over the girls paper as they stamped. The frame allowed them to stamp freely while maintaining a clear border for their list poem. 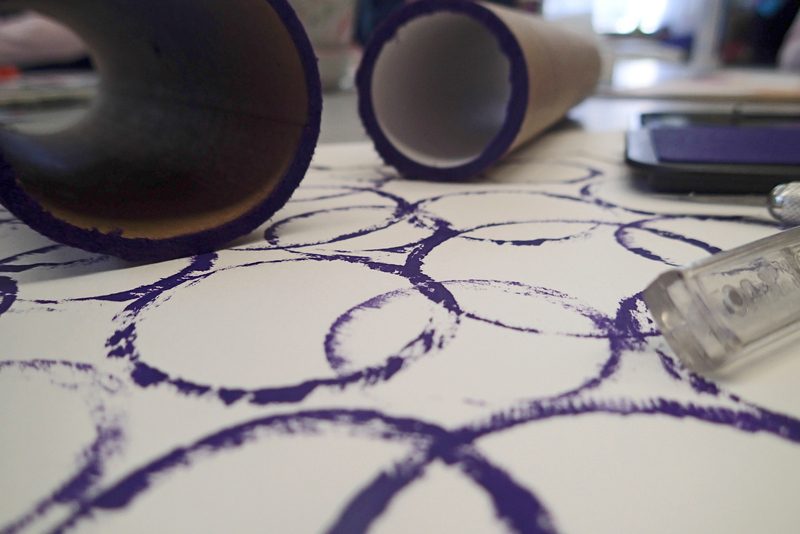 I held the frame in place, as the girls used the cardboard tubes and ink pads to create their bubbles. I was amazed and impressed with the thoughtfulness with which they approached their work. Each girl had her own particular process, but each was purposeful in her choice of tubes (various diameters) and placement of bubbles. My only instructions were to be sure to press straight down so as to get a good print (and not to fret if it was less than perfect, as that added to the uniqueness of each piece) to consider overlapping the bubbles at least a bit, and to not be afraid to overlap the frame. 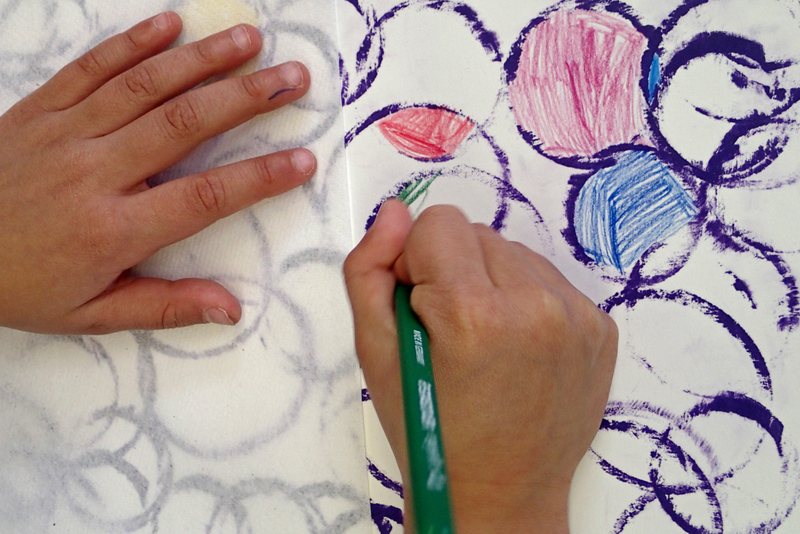 After the ink dried, the girls worked diligently to fill in each full shape (not the partial bubbles around the edges). We discovered that the ink, though dry, sometimes transferred around the paper, so we used a paper towel to minimize movement. Thankfully any transferred ink erased easily. Once finished with their art piece, the girls moved on to their list poems. The goal was to create a list poem and encircle the bubbles with the poem. (We read, observed and discussed poems from Falling Down the Page by Georgia Heard prior to this project, and emulated the freedom Georgia showed in placing words on the page.) Each girl began by choosing 12 words from the class lists and writing them in the frame of her paper. If needed, she chose more words. When everyone was finished – and it took some girls many days to do so – we shared our poems and art pieces with each other. Finally, we displayed them on the hall bulletin board, with black and white photos of each of us blowing bubbles as the border. It’s All in How You Look at It!